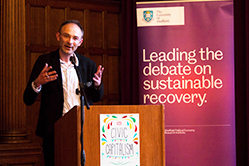 The debate that SPERI is seeking to initiate about ‘Civic Capitalism’ is off to a strong start following the successful launch last Thursday in Sheffield of the book of the same name by Colin Hay and Tony Payne. 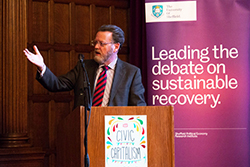 In the apt setting of Sheffield Town Hall, Sir Keith Burnett, Vice Chancellor of the University of Sheffield, introduced the event, before Colin Hay spoke about inequality and set out briefly what ‘Civic Capitalism’ stood for. Tony Payne then talked about the need for a new settlement for global governance if ‘Civic Capitalism’ is to have any chance of succeeding domestically in Britain or any other country. Finally, Ed Cox, Director of IPPR North, gave a provocative and contrasting address, arguing that ‘Civic Capitalism’ would be best fought for at the local level in what he called ‘metro-regions’. moment for anyone interested in a fairer, more equal society. 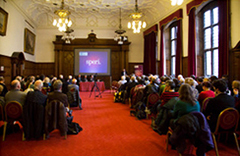 At the end of the event, Colin and Tony expressed their thanks to the many people who attended and spoke of their delight that the debate had started. They added: ‘Now we just want lots of people to read the book. It’s not very long!’.